The unique contributions of memory B cells and plasma cells in kidney diseases remain unclear. In this review, we evaluate the clinical experience with treatments directed at B cells, such as rituximab, and at plasma cells, such as proteasome inhibition, to shed light on the role of these two B lineage compartments in glomerular diseases. Specifically, analysis of these targeted interventions in diseases such as ANCA-associated vasculitis, SLE, and antibody-mediated transplant rejection permits insight into the pathogenetic effect of these cells. Notwithstanding the limitations of preclinical models and clinical studies (heterogeneous populations, among others), the data suggest that memory B and plasma cells represent two engines of autoimmunity, with variable involvement in these diseases. 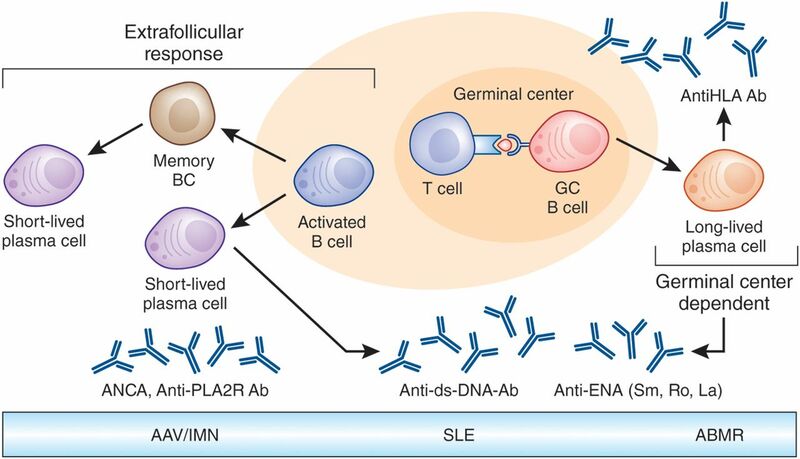 Whereas memory B cells and plasma cells appear to be key in ANCA-associated vasculitis and antibody-mediated transplant rejection, respectively, SLE seems likely to be driven by both autoimmune compartments. These conclusions have implications for the future development of targeted therapeutics in immune-mediated renal disease. In health, memory B cells and plasma cells (PCs) comprise important but independently regulated compartments of our immunologic memory1 (Figure 1). Humoral immunity is key to the pathogenesis of many autoimmune renal diseases. Here B cells, when recognizing (auto)antigens and receiving appropriate T cell help, can differentiate into short-lived PCs, memory B or long-lived PCs also termed memory PCs2. However, their detailed contributions to different kidney diseases are not known. Long-lived PCs are considered ultimately differentiated, bone marrow (BM) resident cells secreting high-affinity antibodies that disseminate through the body, whereas memory B cells3 can rapidly proliferate in a clonally and antigen specific manner, and differentiate and recirculate upon antigen re-exposure. 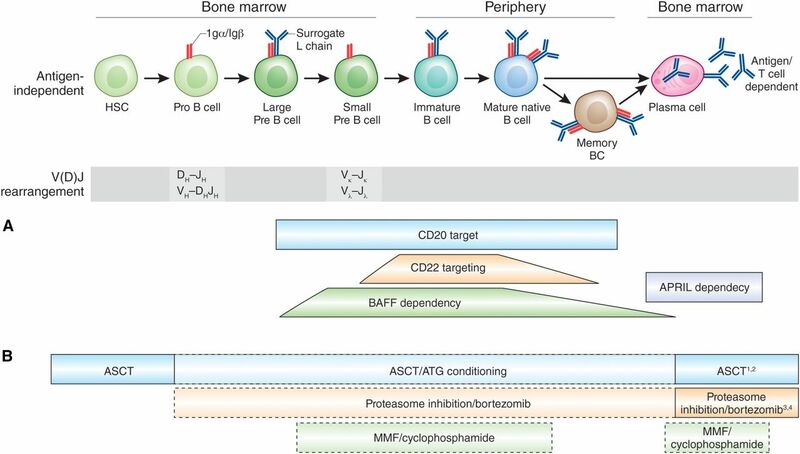 Overall, memory B cells and PCs form two immune defense lines that allow preservation of previous immune encounters by antibodies produced by long-lived PCs and a dynamic component to adapt humoral immunity by memory B cells. The two cellular subsets ensure stability and flexibility to maintain a sufficient B cell lineage defense. The extent to which these “two engines” of B cell lineage memory contribute to different renal autoimmune diseases is not fully understood, but is likely to differ between disorders. In this context, clinical experiences with therapeutics selectively targeting CD20+ memory B cells but not CD20− PCs provided interesting lessons (Figure 2A), e.g., the response to rituximab in ANCA-associated vasculitis (AAV) and idiopathic membranous nephropathy (IMN). In contrast, SLE did not show similarly convincing responses to CD20 targeting. In chronic antibody-mediated rejection (ABMR), the addition of PC targeting agents (e.g., the proteasome inhibitor bortezomib) appears to be beneficial, with less evidence for rituximab.4 Currently available data from more selective immune targeting suggests that the pathogenic relevance of memory B cells and PCs may vary between autoimmune diseases (reviewed recently5), improving our understanding of individual diseases. 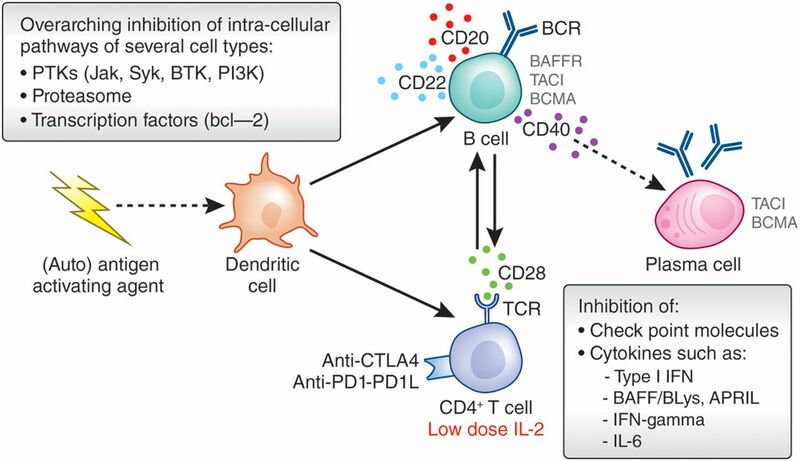 Here we will take a reverse translational perspective to learn from the clinical use of B cell–directed therapies such as anti-CD20 or therapies that target the PC compartment in renal autoimmunity. Distinct PC subsets can be induced via different pathways (Figure 1). First, B cells from the B1 cell lineage, which have been mainly studied in mice and lack a defined phenotype in humans, can form short-lived PCs, which produce polyreactive IgM for immediate defense. Second, B cells from the B2 cell lineage can form short-lived PCs in a T cell–independent manner (so-called marginal zone B2 cells), for example by stimulation with T cell-independent antigens such as pneumococcal capsular polysaccharides, and predominantly secrete low-affinity IgM antibodies.6,7 Moreover, B2 lineage cells are the main source of long-lived PCs and memory B cells upon activation by cognate T cells in germinal centers.8 The generation of long-lived PCs is the result of a two-step process. First, an extrafollicular response leads to the generation of short-lived activated B cells, of which some re-enter the B cell follicle and become plasmablasts in a T cell–dependent pathway. Subsequently, plasmablasts migrate through the blood stream and reside as long-lived PCs primarily in BM niches, possibly also in inflamed tissues.9,10 It is currently debated whether a small number of BM memory PCs can be induced independently of T cells.11,12 The germinal center response is a time-regulated developmental switch, first producing memory B cells and subsequently long-lived PCs13 with increasing affinity. It has long been suggested, but now experimentally proven, that memory B cells can also develop in a T cell–dependent, but germinal center–independent pathway.14 B cell lineage differentiation paths are summarized in Figure 1. The bulk of the data reported above has been obtained from preclinical models, although it remains to be delineated which differentiation pathway(s) and B cell lineages are involved in certain autoimmune conditions. Most but not all memory B cells have undergone class-switch recombination, typically from IgM to IgG, and carry somatically hypermutated IgV gene rearrangements16,17 as one signature of previous T cell encounters. Loss of IgD expression (IgD−) identifies B cells that have undergone class-switch recombination. Switched memory B cells develop during T cell–dependent germinal center responses.13 In addition to Ig subclass B cell receptor (BCR) expression, other phenotypic B memory markers have been identified. Here, expression of CD27 serves as a universal marker for memory B cells in healthy donors. The BCR of memory B cells shows a high affinity to the immunizing antigen compared with naïve B cells caused by using affinity-matured and somatically hypermutated BCR genes.18 Memory B cells that emerge from the T cell–dependent but germinal center–independent pathway do not show somatic hypermutations, and thus are not affinity matured.19 After a given immune response, memory B cells must repress their activation program and rest in a quiescent state for a long period to maintain their memory capacity.20 Upon antigen reactivation, memory B cells become activated and can differentiate either into PCs or further mature by re-entering the germinal center for additional affinity maturation.21 The involvement of memory B cells during resolution of an immune response and the mechanisms by which resident memory B cells are prevented from uncontrolled activation remain unclear for immunity as well as autoimmunity. Notably, disturbances of circulating memory B cells in patients with chronic immune activation have been reported in chronic autoimmune conditions,22,23 such as SLE,22,24 rheumatoid arthritis (RA)25 or in HIV infection26 compared with healthy controls. In this context, enhanced CD27−IgD− B cells as well as CD27−IgD− coexpressing CD95+,27 CD21low28 or intracellular spleen tyrosine kinase Sykhigh29 were found. There is a possibility that these abnormalities result from an overly active immune system with enhanced B cell differentiation, but it is not clear if they result from incomplete germinal center responses, increased extrafollicular activity and/or enhanced T cell–independent B cell activation. Usually, these cells carry characteristics of B cell memory (e.g., mutated IgV genes), expressed costimulatory molecules, or lacked an active ABCB1 transporter as functional characteristic of memory B cells. It is currently not clear if these abnormalities of B cell memory are a source of autoimmunity or result of overly active immune activation. PCs are responsible for maintaining serum antibody levels by continuously producing high-affinity antibodies and reside preferentially in the BM. Only a few plasmablasts that arise from the germinal center response migrate through the blood stream to become memory PCs.9 Crucial for the survival of a plasmablast to become an ultimately differentiated, long-lived PC is that they find appropriate soluble and insoluble (niche) survival conditions, whereas no postgerminal center selection processes of PCs are known. Long-lived PCs, also called memory PCs, find optimal survival conditions in the BM in healthy individuals at the end of a competitive journey starting as an early B lineage cell. Besides the BM, other tissues can also offer survival niches in states of chronic inflammation. These niches disappear when the inflammation is resolved.41–43 Once it was thought that survival niches harbor almost exclusively highly-affinity matured PCs, but other studies revealed that immature PCs can access survival niches.44,45 Recent data suggest that there is heterogeneity of PCs in human BM. Here, a stable and highly differentiated CD19− PC fraction with a distinct phenotype (CD56+, HLA-DRnegative, CD44negative etc.) and a less mature CD19+ PC fraction exist in human BM, which suggests that further differentiation even within the BM PCs is a possibility.46 These human PC subsets in the BM have been confirmed subsequently.47,48 Because CD19− PCs usually enriched in human BM were also found in autoimmune tissues including kidney transplant rejection,46 it needs to be further delineated what factors are involved in their induction and/or maintenance in autoimmunity. Notably, a potential role of T cells within the BM has been suggested recently. Here, regulatory T cells (Treg) cells share a particular niche with PCs in CD11c+ BM cells and appear to regulate PC survival via CTLA-4.49 This suggests that T cells have distinct but largely unknown functions determining the lifestyle of PCs and mandates further studies. Different animal models for SLE, the two AAV conditions (myeloperoxidase [MPO] or proteinase 3), and ABMR could provide evidence for the role of B lineage cells. Here analyses of T cells and relevant autoantibodies50–52 provide the basis that activation of B cells has taken place. However, the particular role of B cells independent of PC producing autoantibodies has only been clearly demonstrated in a lupus model.52,53 Tables 1 and 2 summarize key features, advantages, and disadvantages of the most instructive animal models in which B cell and PC contributions have been studied within AAV, lupus nephritis, and ABMR. Because expression of certain surface markers on memory B cells and PCs are distinct, selective targeting by using specific agents is a clinical possibility. Memory B cells show the phenotype of mature B cells expressing CD19, CD20, and CD22 besides the above discussed surface markers. PCs differ on the basis of their larger size and granularity, as well as loss of CD20 and CD22 expression, downregulation of CD19, and expression of CD38 and, to large extent, CD138.8 Memory B cells express three B cell cytokine receptors, BAFF receptor (BAFF-R), transmembrane activator and CAML interactor (TACI), and B cell maturation antigen (BCMA), whereas PCs have very diminished BAFF-R and TACI expression but receive survival signals through BCMA. There is differential signaling of BLyS/BAFF and APRIL through these receptors. We will briefly summarize certain agents that have an effect on PCs or (memory) B cells. The monoclonal daratumumab targets CD38, which is highly expressed on the surface of short-lived PCs, long-lived PCs, and myeloma cells,89 but only expressed at low levels on lymphoid or myeloid cells and some other tissues.90 Daratumumab monotherapy was recently approved for the treatment of refractory multiple myeloma on the basis of two studies.91–93 Also, the addition of daratumumab to standard care has shown favorable results,94,95 with an overall acceptable safety profile.96 Nonetheless, a high number (71% of patients) of adverse reactions of cough, bronchospasm, and dyspnea were observed upon infusion of daratumumab.93 Patients with autoimmune diseases have not yet been treated with this antibody but it appears to lead to a profound depletion of plasma cells. A number of recent efforts have been made to target certain factors involved in PC homing/migration or interfere with their survival in order to affect long-lived PCs otherwise refractory to treatment (reviewed recently2), including autologous stem cell transplantation.97 Clinical experiences are very limited. In contrast, the extrinsic and intrinsic characteristics of memory B cell maintenance are far less understood. Circulating BAFF levels correlate with disease activity in AAV and therefore this cytokine has been suggested as potential treatment target.115–117 An ongoing trial is addressing the role of BAFF inhibition in patients with AAV: BREVAS is evaluating belimumab in combination with azathioprine as maintenance of remission after a standard induction regimen (Clinicaltrials.gov identifier NCT01663623). This approach follows the hypothesis to selectively block enhanced BAFF and reduce ANCA producing peripheral PCs and thereby affect AAV activity. A further study, COMBIVAS, is addressing the combination of BLyS/BAFF blockade and anti-CD20 on the basis of two hypotheses: that local BLyS/BAFF impairs B cell depletion at inflammatory sites and that the BLyS/BAFF surge seen after rituximab, due to the reduction of B cell BAFF-R clearance, promotes autoreactivity in the reconstituting B cell repertoire. BLyS/BAFF inhibition is also effective in IMN, where it significantly reduces anti-PLA2R antibodies titers within 28 weeks (Clinicaltrials.gov identifier NCT01610492). There is little experience with agents targeting PCs in AAV. Bontscho et al.118 reported that bortezomib is able to inhibit anti-MPO–mediated necrotizing crescentic GN in mice by depleting MPO-specific PCs in the spleen and BM. A favorable effect of proteasome inhibition was also reported in one patient with AAV,119 but precludes any firm conclusion in the absence of larger experiences. The contribution of CD20+ and especially memory B cells became apparent by experience with B cell–depleting agents, such as rituximab. In several reports the reconstitution of the memory B cell subset after rituximab predicted recurrence of active disease.136,137 This phenomenon has not exclusively been observed in SLE but also in patients with rheumatoid arthritis25,138 and IMN, and suggests that memory B cells contribute to the pathogenesis of these diseases. A reduction in autoantibody titers, in contrast to AAV, did not always predict the effectiveness of rituximab therapy.139 Rituximab did not meet the primary efficacy end point in a lupus nephritis trial (LUNAR),140 partly due to aspects of the trial design. Clinical experiences141,142 in otherwise refractory patients support a clinical value that has led to recommendations as a second line agent by the American College of Rheumatology143 and European League Against Rheumatism-European Renal Association/European Dialysis and Transplant Association.144 Rituximab, in combination with mycophenolate mofetil, has been reported in newly diagnosed patients with lupus nephritis in a UK center,145 with a substantial rate of patients achieving complete remission without use of oral glucocorticoids. This study requires confirmation in treatment-naïve patients, whereas the currently available data suggest that anti-CD20 depletion alone may not be sufficient in patients with established disease. In this population, the additional role of PCs likely requires cotargeting. Efforts to preferentially target the PC compartment have been undertaken. In a murine model of lupus-like nephritis, short- and long-lived PCs were depleted by bortezomib and lupus-like nephritis improved remarkably.83 These results were confirmed by Ichikawa et al.153 and Seavey et al.,154 using the less toxic proteasome inhibitors carfilzomib87 and delanzomib.88 Clinical experiences with proteasome inhibition in lupus nephritis rely only on bortezomib. Alexander et al.155 reported 12 patients with refractory SLE including six patients with nephritis. Musculoskeletal and mucocutaneous manifestations improved in all patients, and proteinuria significantly decreased in patients with nephritis. A recently published study reports a beneficial effect with a decrease in creatinine in three of five patients with lupus nephritis.156 A phase 2 study is currently investigating the safety and efficacy of bortezomib in patients with SLE (Clinicaltrials.gov identifier NCT02102594). A phase 1 study in lupus nephritis with the oral proteasome inhibitor ixazomib is underway (Clinicaltrials.gov identifier NCT02176486). Although proteasome inhibition is often considered a PC-targeted therapy, it has the advantage to cotarget PCs but also affect other immune cells.155 A potential difference of lupus nephritis versus AAV is that effective B lineage therapy requires cotargeting of memory B cells and PCs. B cell–directed therapy by rituximab seems to be partially effective in acute ABMR but ineffective in chronic ABMR.171 Jackson et al.172 provided interesting evidence about long-lived PCs in humans and the capacity of rituximab to interfere with relevant B cells as PC precursors when they compared DSA levels in patients who have been desensitized with or without rituximab. They found a greater reduction of DSA but a similar rate of DSA persistence, most likely explained by refractory long-lived PCs, whereas the difference in DSA titers can be ascribed to memory B cells undergoing differentiation into PCs. Kidney transplantation permits comprehensive corresponding insights in tissue resident immunology. Just as in other glomerular diseases, tertiary lymphoid structures have been identified in kidney grafts.173 Within the tertiary lymphoid structures an increase of activated memory CD4+ T cells and a decrease in T regulatory subsets (IL-10–producing Tr1 cells and Foxp3-positive Tregs) has been observed.174 Also PC-rich infiltrates have been found in renal allografts and their occurrence was associated with an increased risk of allograft failure in the pediatric population.175 However, data on PC-rich infiltrates in the adult population are limited.176–178 To target the PC compartment, proteasome inhibition has been included in the treatment repertoire. In a model of chronic allograft nephropathy, bortezomib reduced antibody titers and depleted PCs in the BM.179 The reduction of PCs was also observed in BM aspirates of two patients treated with bortezomib for humoral rejection.180 Several small case series report the effect of bortezomib treatment on graft survival, kidney function, and DSA levels. Overall, patients responded together with a reduction in DSA levels and a stabilization of kidney function in refractory patients.181 The BORTEJECT (Clinicaltrials.gov identifier NCT01873157),182 the TRIBUTE study (Clinicaltrials.gov identifier NCT02201576), and the Effect of BM-MSCs on Chronic AMR after Kidney Transplantation study (Clinicaltrials.gov identifier NCT02563340), will evaluate the clinical value of bortezomib on chronic ABMR. Notably, levels of BAFF were found to be associated with the occurrence of transplant glomerulopathy183 and enhanced ABMR,184 thus BAFF targeting appeared an attractive option. However, a study of tabalumab for desensitization did not lead to clinically significant reduction of DSA,185 which may be taken as another indicator that outstanding long-lived PCs are a key challenge in this clinical setting. Studies of belimumab for pretransplant desensitization and at the time of transplantation are ongoing (clinicaltrials.gov identifier NCT01025193). An innovative approach to reduce HLA antibodies in the setting of desensitization of highly sensitized patients is the use of the endopeptidase derived from Streptococcus pyogenes (IdeS), which cleaves IgG into F(ab′)2 and Fc fragments. IdeS leads to a complete IgG deficiency what makes it less attractive for long-term use in chronic ABMR.186 However, early clinical experiences with IdeS in renal transplants provide additional proof that targeting autoreactive PCs is key in targeting ABMR. A number of preclinical models have supported the role of B lineage cells in glomerulopathies, but do not reflect the complexity of human diseases. Interventions in human disease have inspired a revision of the role of B cells and long-lived (memory) PCs in these entities. Here, currently available data support a key role of B cells (likely memory and activated B cells) in AAV and IMN, and long-lived PCs as a pathogenic driver in chronic ABMR, whereas lupus nephritis appears to be under the influence of both B cells and PCs (Figure 4). As a consequence, the idea that distinct immunopathogenic contributions by memory B cells and PCs is also probably related to distinct T helper cell abnormalities requires consideration. E.S. is supported by the Charité Junior Clinical Scientist Program (Charité-Universitätsmedizin Berlin and the Berlin Institute of Health). Related support has been provided by projects funded by the German Research Foundation (SFB650, 633, CRC “Immunobone,” TR130, and individual DFG projects Do491/7-4, 8-1,2, 10-1, all granted to T.D. ).